Save the Frogs Ghana Executive Director Gilbert Adum, who led the nine-member team that made the important discovery, says “we have looked forward to this moment for the last four years. We are excited about the discovery as this has given hope that we can save the Squeaker Frog from extinction." Kumasi, Ghana, October 23, 2013 - After four years of intensive search for the Krokosua Squeaker Frog (Arthroleptis krokosua), a team of scientists from the nonprofit SAVE THE FROGS! 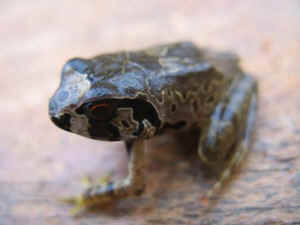 Ghana found the critically endangered frog at Ghana’s Western Region Sui River Forest Reserve. SAVE THE FROGS! Ghana Executive Director Gilbert Adum, who led the nine-member team that made the important discovery, says “we have looked forward to this moment for the last four years. We are excited about the discovery as this has given hope that we can save the Squeaker Frog from extinction.” Students from the Kwame Nkrumah University of Science and Technology's Department of Wildlife and Range Management assisted on the expedition. However, SAVE THE FROGS! Ghana Program Coordinator Sandra Owusu-Gyamfi, who was on the team, laments that the Sui Forest faces severe threats from logging, mining, farming and invasion of the alien Devil Weed, popularly called Achempong weed. She says that the weed invasion and the habitat destruction activities may be the reason the Squeaker Frog is not getting the chance to recover from the brink of extinction. Gilbert Adum states there is every need for government and conservation organizations to ally with SAVE THE FROGS! Ghana, which is dedicated exclusively to conservation of Ghana’s amphibians, to ensure the continued survival of the Giant Squeaker Frog. The team is also calling on the Forestry Commission and government to immediately delineate and protect the Squeaker Frog’s habitats permanently from any form of exploitation. Dr. Kerry Kriger, founder of SAVE THE FROGS! USA, is calling on the International Union for Conservation of Nature (IUCN) to officially classify the species as Critically Endangered. This project received funding from the Conservation Leadership Programme, the Rufford Small Grants Foundation, the German-based Stiftung Artenschutz (Species Conservation Foundation) and SAVE THE FROGS! USA. The researchers would also like to acknowledge the support of Professor William Oduro, Head of KNUST Wildlife and Range Management Department and the undergraduate students who formed part of the team.